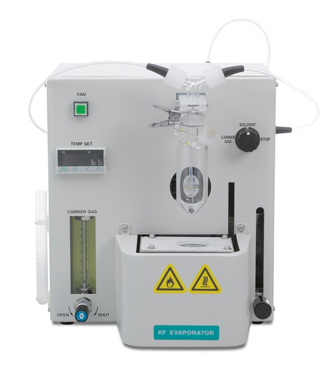 The KF Evaporator is used for sample preparation in Karl Fischer titration by means of azeotropic distillation. As with the oven method, the water is separated from the sample matrix. Because the sample itself remains in the evaporation chamber, the titration vessel and the electrodes are not contaminated. Furthermore, unwanted side reactions and matrix effects are avoided. Metrohm’s Karl Fischer Oil Evaporator is primarily used for the moisture analysis of samples that are neither suitable for direct titration nor for the oven method. Such samples include tars, crude oils, viscous resins and more. The KF Evaporator uses azeotropic distillation for separating the water content from these hard-to-analyze samples: the sample is dissolved in a suitable solvent and heated; a flow of dry carrier gas transports the moisture into the titration cell, and the moisture is titrated. Because the sample itself remains in the evaporation chamber, the titration vessel and the electrodes are not contaminated, keeping your results safe from side reactions and matrix effects. The KF Evaporator is specified in method ASTM D890-98 (2008) – Standard Test Method for Water in Liquid Naval Stores.